Last Saturday was a very magical morning. 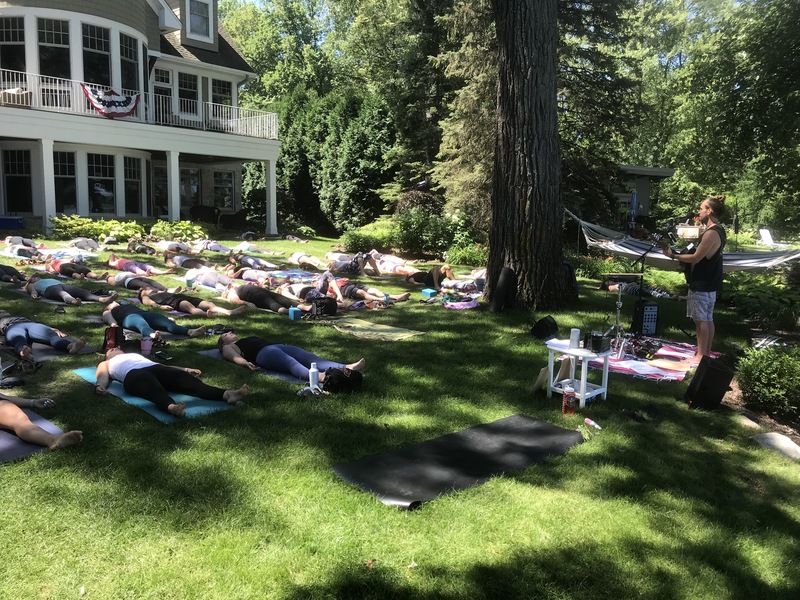 The weather was perfect for Lakeside Yoga and on this day one of my favorite people, Kevin Paris, was with us playing his dreamy tunes as the class flowed through our poses. This was our 3rd year having Kevin play his music that is ideally crafted and performed for this very kind of venue. If you would like to hear more of Kevin’s music please visit, www.kevinparismusic.com or find him on Spotify, you will fall in love with his vibe. This year’s class benefitted Ann’s Hope Foundation, (www.annshope.org), an organization that I have been involved with for over 14 years to raise money and awareness in the fight against Melanoma Cancer. This disease is still one that has a lot of misunderstanding as to the dangers that unprotected sun exposure can have on our lives. And yes, Melanoma is a deadly, so get regular skin checks and be vigilant about sunscreen and exposure not only with yourself but also with friends and family members! Onto the day! To give you an idea of the energy that was created and the beauty of the scene, I will tell you that I had some of the attendees describe being so overcome with emotion and positive energy and having experienced an indescribable presence. 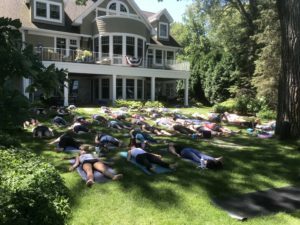 At one point, there was a brief gust of wind during Savasana that came up where there had been no wind throughout class. Waves lapped upon the shore at this moment, where the lake had been still all morning long. A friend felt as if there were spirits swirling about. Most of us are not woo woo type of people at all and this was an interesting phenomena that we all experienced. I just love when this happens, it reminds us that we are not alone and when people come together to collectively bring positive and loving energy, it can create magic and elevate everyone involved! Let us try and remember that we can and do make a difference with even the smallest of efforts and the littlest of steps. Each small step leads us to be immensly impactful. Ekhart Tolle describes that when we do things with joy, love and presence, we hold up the frequency and elevate the consciousness of the planet. Certainly something we all can use more of in our lives! To see a short video of Kevin playing for this class please visit my Instagram link here: Kevin/Cheri Yoga.